Audi A1 Sportback prices and specs | What Car? 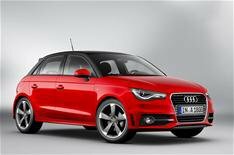 The Audi A1 Sportback the five-door version of the Audi A1 supermini will cost from 13,980. That's a 560 premium over the entry-level three-door version. A 2.0 TDI model will go on sale in the summer. Also joining the line-up will be a new 138bhp 1.4 TFSI petrol engine with Cylinder on Demand technology. This is where the engine can close off two of its four cylinders during cruising, for example to reduce fuel consumption and lower CO2 emissions. When fitted with this engine, the A1 Sportback averages 60.1mpg and emits 109g/km of CO2. This version offers similar power and economy to the 2.0-litre TDI, but will be cheaper although Audi has yet to confirm prices and more tax efficient because it doesn't incur the 3% company car tax penalty that diesel engines carry. The A1 Sportback is slightly higher than the three-door car, giving more headroom for rear-seat passengers. The three-door version is a four-seater, whereas the A1 Sportback seats five, although the centre rear seat is narrower than the outer two. The boot is no bigger than in the three-door version, with 270 litres of luggage space with the seats up and 920 litres with them folded down. Three trims are available SE, Sport and S line. All models get alloy wheels, air-con, split-folding rear seats, electric windows and a CD player with MP3 compatibility.